YES OR NO?- LAWYER TOO BUSY TO ANSWER PRESPA DEAL QUESTION – Alternate Comms. 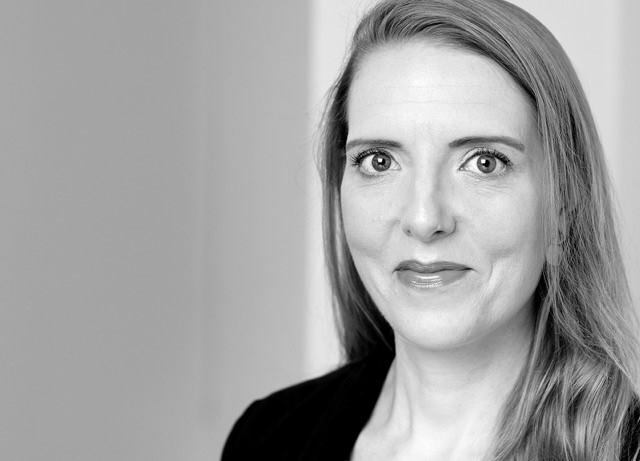 A spokeswoman for a prominent Anglo-Irish international jurist said the lawyer was too busy to answer whether or not she was involved in drafting the controversial Prespa Agreement signed by Greece and Macedonia, which will erase Macedonian identity, this despite the lawyer being engaged to “advise” Macedonia on name change! -I wanted to ask you if you were involved in drafting or putting together the Prespa Agreement? -Were you approached by the Macedonian government in any way? 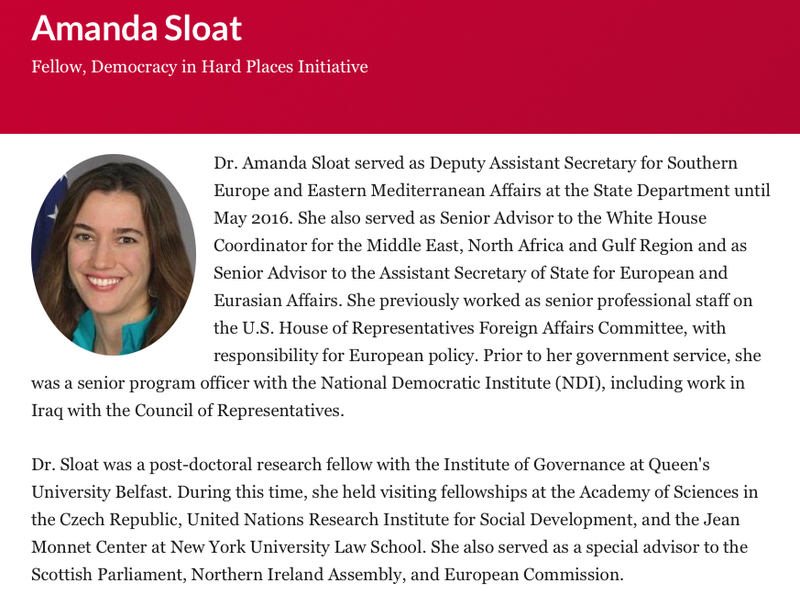 -Were [ex US State Department official] Dr Amanda Sloat and ######## involved in the preparation of the Prespa Agreement? 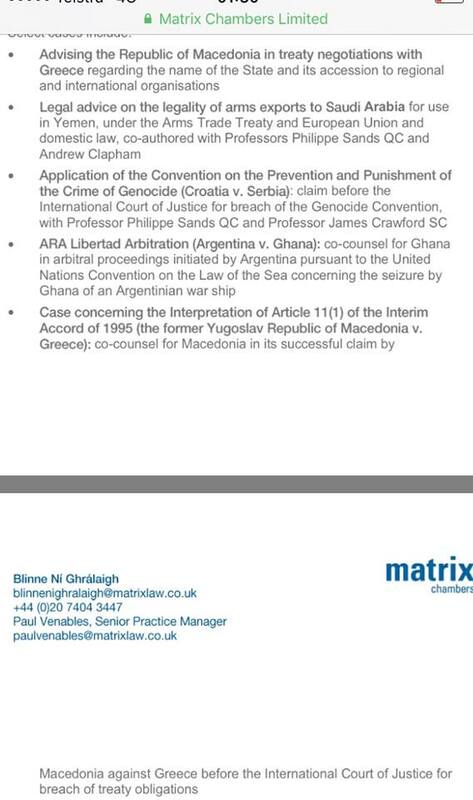 Ms Ni Ghralaigh lists in her legal CV (resume) as advising Macedonia on name negotiations with Greece in relation to joining international organistions. 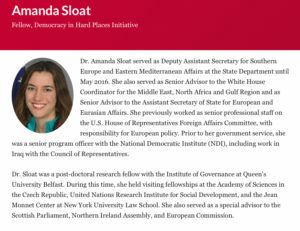 She has previously worked for Macedonia in its legal case against Greece over the 1995 Interim Agreement. Macedonians recently boycotted in large numbers a referendum held on 30 September this year over accepting the Prespa Agreement which would change Macedonia’s name to North Macedonia in order to satisfy Greek nationalist demands and remove Athens’ veto over Macedonia’s application to join the EU and NATO. Critics see the Prespa Agreement as being drafted by the United States and imposed upon Macedonia for Washington’s strategic needs but deliberately presented as though it was the joint product of Macedonia and Greece. Sasha Uzunov: [US] Ambassador Baily, sir, did Amanda Sloat write the Prespa Agreement, sir, a former US State Department official, sir? Did she write it, sir? From the Brookings Institute. Do you wish to comment Ambassador Baily, sir? Amb Baily: Mr Uzumanov [Uzunov], um, I think that is one of the most ridiculous things I’ve ever heard in my life. The Prespa Agreement was negotiated by the governments of Macedonia and Greece with the help of the United Nations. I don’t think you need to look any further than that. Thank you very much. Sasha Uzunov: You would testify before [US] Congress and Senate, sir? Sasha Uzunov: No worries. Thank you for your comment, sir. The Defence Minister, Ms Radmila Sekerinska, reacted somewhat bizarrely over being asked if Dr Amanda Sloat was the author of the Prespa Agreement. Macedonia Parliament vote wash up on the controversial Prespa Agreement- the massive police presence in town in the capital Skopje during the day suggested that the vote was on tonight in the Assembly. 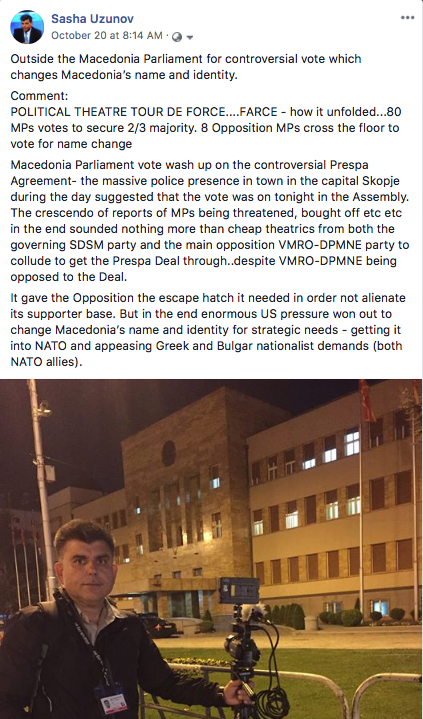 The crescendo of reports of MPs being threatened, bought off etc etc, in the end, sounded nothing more than cheap theatrics from both the governing SDSM party and the main opposition VMRO-DPMNE party to collude to get the Prespa Deal through..despite VMRO-DPMNE being opposed to the Deal. It gave the Opposition the escape hatch it needed in order not alienate its supporter base. But in the end, enormous US pressure won out to change Macedonia’s name and identity for strategic needs – getting it into NATO and appeasing Greek and Bulgar nationalist demands (both NATO allies). The vote now opens up the Macedonian constitution to be changed as per the Prespa Agreement – namely Macedonia becoming North Macedonia; giving up any claims to any ethnic Macedonian minority in Greece, changing history books, removing any reference to Greece’s brutal colonialism of Macedonia and Macedonians beginning in 1913 when the territory was partitioned between Serbia, Greece, and Bulgaria and in effect giving Greece de facto right to interfere in Macedonian sovereignty. And removing any reference to a Macedonian national identity but Albanian identity plus the other ethnic minorities keep their identities intact. It’s George Orwell’s 1984 frighteningly come true. A police like apparatus will enforce that no mention of Macedonia is made without the prefix North. In return for all of this is Greece not blocking Macedonia’s entry into both the EU and NATO. Moreover, the constitutional changes envisioned would include placing the Ohrid Framework Agreement, the 2001 deal signed after the ethnic Albanian uprising, instigated by the US, which has turned Macedonia into an unofficial federation, in the constitution. This would in probability facilitate Albanian secession from Macedonia down the track. Moreover, Inserting the Ohrid Framework Agreement into the Macedonian constitution is a deliberate ploy by the US to give it an alibi for unleashing the 2001 ethnic Albanian war in Macedonia. see link to Guardian article from 2001. Opponents to the Prespa Agreement claimed that dirty tricks were used to get 8 Opposition MPs, mainly from the VMRO-DPMNE party, to cross the floor. Some had been indicted for corruption or terrorism charges related to the 27 April 2017 parliamentary attack and had allegedly been offered a deal for their vote. Some even went as far as claiming that last year’s parliamentary attack had been delibrately staged managed to be later used as blackmail. Others suggested that both the ruling SDSM government and the main Opposition VMRO-DPMNE were in collusion in order to get the Prespa Agreement through. Whatever the veracity of the various claims may be, what is puzzling is the behaviour of a prominent US official. The US State Department had issued a “warning” letter to VMRO-DPMNE Opposition leader Christian Mickovski to accept the Prespa Agreement. The EU wasn’t prepared to comment at any cost. This redefinition of Macedonian identity, history, language and culture is the real aim of Greece, since outside of North Macedonia there will be no Macedonian resident population, no Macedonian history, language and culture. In this way, the cloth of silence could once and for all be spread once and for all through the brutal Greek annexation of Aegean-Macedonia in 1913, with its non-Greek majority population (Turks, Bulgarians, Macedonians), compulsory Greekization and human rights violations. Aegean-Macedonia did not receive its new Hellenistic character until the settlement of the Little Asiatic Greeks in 1923, on the basis of the Treaty of Lausanne. The surprise was great on the evening of September 30th. Among the Balkan correspondents and ambassadors in Skopje. * The elite of Brussels, who had come to support the government in Skopje, which had been brought to power by means of a “regime change” by the EU and the USA last year, to the very last media. In the US and NATO, urgently need Macedonia as a staging area for the encirclement of Russia to master the “Eurasian chess board” (Zbigniew Brzezinski Quote). In the non-binding referendum on the Macedonian-Greek prespa agreement aimed at settling the name dispute, almost two-thirds of voters from all camps in the urn stayed away last Sunday. Ethnic Macedonian voters expected to follow the boycott appeal. What was surprising, however, was the low participation of the – according to their politicians – per EU and per NATO oriented Albanian population. This shows that, on the one hand, the actual size of this population group no longer corresponds to the results of the (most recent) census of 2002, on the other hand, the Albanian scene should no longer follow its political representatives as homogenously as it once did. But it is only superficially about the rejected from Greece state name of the Republic of Macedonia. In addition to the amendment to “Republic of North Macedonia”, the Prespa Agreement provides, in particular, for the term “Macedonian” to refer only to the territory of North Macedonia. However, “Macedonia” geographically covers a much larger area than today’s Republic, especially today’s northern Greece. The term “Macedonian” as a term for an independent population together with its language and culture, which has developed in this area….